One of Korea’s all-time great race-mares kicks off her 2019 season on Sunday afternoon and Silver Wolf, never one to be shielded from a challenge, will face stern examination as she seeks to defend her Donga Ilbo Trophy title over 1800M at Seoul Racecourse. An Australian-bred by Oratorio, Silver Wolf was purchased as for $40,000 at the Magic Millions Gold Coast Sale in 2014. She’s since gone on to amass over US$1.5Million in prize money and in 2017 swept all three legs of the Queens’ Tour to be named Champion Filly/Mare. Competent at any distance, after winning this race last year, she went to Busan and defeated Power Blade over 6 f in the Busan Ilbo Cup. Chief among the pretenders is Sky Bay. 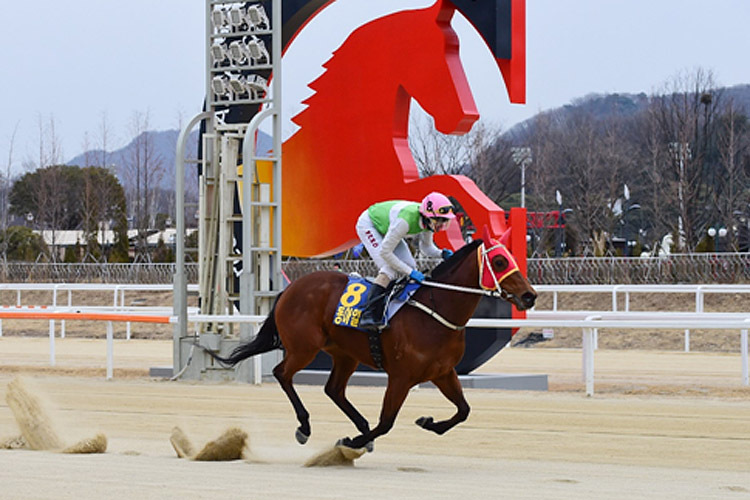 Lee Shin Young’s American import by Adios Charlie is a winner of five of her nine starts so far and concluded her three-year-old campaign by winning the final leg of the Queens’ Tour, the Gyeongnam Governor’s Cup, over 1 1⁄4 m, at Busan in November. That victory gave handler Lee the distinction of becoming the first female trainer to saddle a Group race winner in Korea. Sky Bay will carry 7lbs less than the reigning champion could well be getting better. The Donga Ilbo Cup is race 9 on an 11-race Sunday program at Seoul. There is also a 6-race card at Busan.